Does revegetation provide new opportunities for wildlife? Will restoration in cleared landscapes 'bring back' woodland dependent species in greatest decline, such as Sugar Gliders and Eastern Yellow Robins? These will be the key indicators of success or failure to manage biodiversity loss in future. Deakin University researchers surveyed birds, mammals, frogs and butterflies at forty-three 800ha landscapes in Western Victoria. Birds were the focus because avian communities are a conspicuous and abundant component of biodiversity, whose ecology is well known and are better represented throughout the ecosystem than the other groups. The research shows that wooded vegetation is particularly important in the landscape and that although revegetation increases species richness, "for the same overall amount of vegetation, landscapes with remnant vegetation or a mix of remnant and revegetation have more species than a landscape revegetation alone"
Why is this the case? 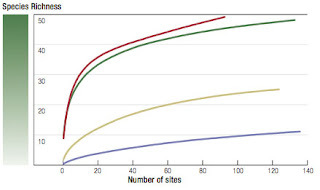 It comes down to a difference in the initial "biodiversity" value of different sites. Remnant vegetation has an altogether more complex structure and composition than revegetation. It has more extensive canopy cover, taller trees, more old hollow-bearing trees, higher cover of native grasses, fallen timber and less small to medium-sized trees and shrubs. Although as the vegetation matures, the gap between remnant and revegetation structure narrows, this can take a hundred years or more. In short, investing in areas where there is some existing value greatly improves the chance of short-term benefits for wildlife. The cumulative number of woodland bird species increases with increasing number of survey sites. Accumulation curves represent species counts in remnant (red), revegetated (green), scattered tree (beige) and paddock (purple). These results have important implications for the rural landscape but also the future of biodiversity management generally. Biodiversity is the most important factor in sustainable development and drives decision-making both in the farming and urban landscape where modifications to the environment are made daily. If we fail to create a net-gain, or even a no-net-loss outcome through our decisions and action, then we will not meet important international obligations. Maximising outcomes through appropriate choice of revegetation site and best management practice is one simple way to ensure maximum success. "Biodiversity offsets should be designed and implemented in a landscape context to achieve the best measurable conservation outcomes, taking into account available information on the full range of biological, social and cultural values of biodiversity and supporting an ecosystem approach". Elsewhere, offsets have often come under criticism for having immeasurable benefit. Problems can arise particularly when there is over-emphasis on "like-for-like" e.g. the intent to recreate as close as possible, what was lost. "Proving" that the job has been done rigorously falls to the only measurable and therefore legally-defensible short-term criteria, that is benchmarking species composition. As described in research by Deakin University, the real "like-for-like" may not be achieved for a hundred or more years...(see also, presentation by Dr Phil Gibbons) it may perhaps never be achieved, due to irreversible shifts in the ecology of the system, such as inherent breakdown of soil structure or climate change. "Landscape restoration requires a long-term perspective. The composition and structure of planted vegetation changes through time, with a lengthy time-lag before the full benefits of revegetation are realised". This is all the more reason to assume that remnant vegetation needs to be protected but it also means we need to rethink our approach to revegetation. Offsets are now recognised as a driver for sustainable development. If we pour well needed funds from offset into sites without maximum biodiversity benefit, then we may fail to address biodiversity loss in the long-term.